George Walker: The inspiration for the woodcut novel was the Belgian artist, Frans Masereel. I first came across his work at an exhibition at the Art Gallery of Ontario in the 1980s. I started collecting his work shortly after that. Surprisingly his books (with wood engravings printed directly from his blocks) were very reasonably priced. The publisher Kurt Wolff made a wonderful series of his wordless novels in the 1920s with introductions by such eminent figures such as Hermann Hesse and Thomas Mann. Eaton: About how many woodcut novels were published in the 20th century? Walker: I would defer this question to my colleague David Berona who speaks to this in his book, Wordless Books: The Original Graphic Novels. The problem is of course definition of the term woodcut novels. For example the book Destiny by Otto Nuckel was engraved on lead because of a shortage of wood but the technique he uses stems from his experience as a wood engraver. I would want to include him in this number but some would argue otherwise. 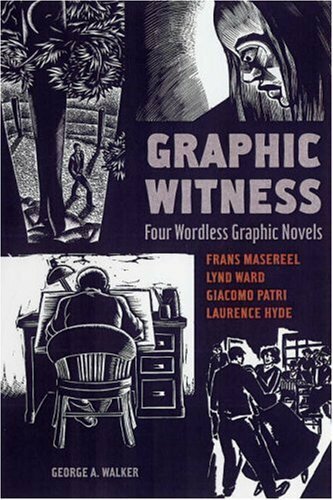 Eaton: What generated the creation of Graphic Witness? Walker: Based on my personal collection of wordless novels by Frans Masereel, Lynd Ward, Giacomo Patri, Laurence Hyde and others I contacted a number of publishers about reprinting these works and providing a contemporary context for their influence on comics, printmaking and film. Firefly Books was very receptive to the idea. Most of the rights holders were very enthusiastic about seeing their relatives’ work in print again. My wife and I made the journey to Ottawa to meet with famous spy novelist Anthony Hyde to request permission to reprint his father’s work Southern Cross. Over tea Mr. Hyde showed us his father’s engraving tools and original sketches and prints as we sat in awe at the marvelous collection preserved with such care and love. Mr. Hyde granted us permission to reprint his father’s book and we are grateful to him for his generosity. We were happy to connect David Berona (who has become a friend of ours) with Mr. Hyde for permission to reprint Southern Cross for his very fine Drawn and Quarterly edition. Eaton: What was the decision process for the particular selections in Graphic Witness? Walker: All the books in Graphic Witness are from my own library. As far as choosing, it really came down to which books I could secure a letter from the family (or the rights holder) to grant permission to reproduce the whole book as the artist published it. The other factor is that all these wordless narratives are relief printed from wood or linoleum blocks. David Berona had already negotiated reprints with Dover for some of the Masereel work and the Redstone Press had done a reprint of Passionate Journey in the 1980s, so I wanted to select work that was no longer in print. Masereel’s work Die Passion appeared in 1918 and I felt that it marked the beginning of this form of narrative story. Hyde is Canadian like I am but also his work speaks to a contemporary issue that is still potent: destructive power of the nuclear bomb. All the books have in common relief printing as the process of making the images, and thematically, concern for social issues and the struggle for control of our own lives. Eaton: Do you distinguish between woodcut novels and comics? What would that be? Walker: Yes, they are different narrative formats of sequential art! The woodcut novel is a direct descendant of the block books and the religious woodcut narratives of the 15th century. Jacobus di Theramos’ work The Early History of Man (1484) is a good example of this block narrative style. I suppose comics could hold this same lineage and that the cave paintings found in France are a type of pre-history wordless narrative too. Comics however are a popular mass media format that has a separate history and narrative problem. The woodcut novel has closer relationship to art history evolving from German Expressionism and its interest with an emotive response to human suffering and the sociological concerns of culture. Graphic novels and woodcut narratives share a kinship with each other through the province of visual culture, but they are separate media both in process and presentation. Eaton: Why did you decide to do your own woodcut novel? Walker: I have been planning to do one for years but was struggling with other projects that kept interrupting my focus. The events of 9-11 changed all that for me when I realized that the cultural paradigm had shifted and that I had to document the event. Writing about it was not sufficient for me to explain the complexities and symbolic shifts in our cultural climate. Words have many limitations that images do not have, especially when it comes to capturing the subtle all-encompassing shift in the grand narrative of western culture. Eaton: What challenges did you face in pitching the idea to publishers? Walker: The popularity of graphic novels and the sales figures for that market segment helped to convince the publisher that the book would have a chance of fair sales return for the investment. Eaton: Technically, what challenges did you find with The Book of Hours? Walker: During the technical making and preparation of the blocks (over 100 of them) each block had to be exactly .918” high to work on my Vandercook SP15 proof press (as in all letterpress projects). The next challenge was preparing each block’s surface on which to draw the reversed image. This required a careful sanding and then a series of fine polishing on a dead flat stone surface. I then engrave using the tools of the silversmith on the endgrain of Canadian maple. (for more detail see my book, The Woodcut Artists’ Handbook) Of course if I made a mistake in the engraving process I could not easily correct it. Everything all along had to be checked in a mirror, as the drawing on the block would be reversed again once it was printed. The press can be a tricky machine and I would spend hours tweaking the paper, ink and impression to pull the best possible proof. 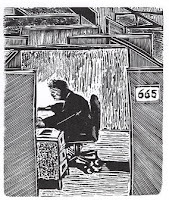 It’s not at all like making a comic, although both start with sketching the printmaking involved in the woodcut novel takes the artist on a tactile journey through the process of reversals and presswork to finished image. The wood engraved narrative is more an assembly of visual signifiers arranged one block at a time without the problems, limitations and cultural baggage sometimes precipitated by words. Eaton: Conceptually, what challenges did you find with The Book of Hours? Walker: Constructing a narrative that flowed through a sequence of people and places yet told a larger story of place and time was difficult. I had to play with the sequencing and pace relating to the events that led up to 9-11. One of the things that helped me was to follow the detailed weather reports from New York City for the day before and the day of September 11th. Eaton: Unlike the selections in Graphic Witness, The Book of Hours is a decentered narrative, focused around an event with characters moving in and out; why did you choose that route? Walker: It is a deliberate narrative of the everyday. It is the mundane routines of our everyday lives that are centered on the immediate concerns of sleep, food, work and travel that consume us. Those World Trade Center employees and visitors are the people I wanted to honour. The media provides us with a bias news and entertainment that leaves us narcotized to the devastation that lurks behind our cultural façade. I chose this route to point to the end of the post modernist narrative and the dawn of a new historical period that questions our understanding of the words ‘everyday’,‘security’ and ‘terrorist’. Eaton: How do you feel that your woodcut novel manages to convey this? Walker: This is a good question and I am not sure that my piece conveys it fully. But I believe that our sense of security, the idea of ‘the terrorist’ in society and our notion of ‘everyday’ — meaning the comings and goings and what we expect to find in our everyday movements and engagement with those around us, has changed fundamentally in our society. After 9-11 we no longer think we are safe from terror and our feeling of trust in the world has changed. The ‘other’ in our community who is not like us —is suspicious to our constructs and notion of safe and acceptable. Our idea of borders and community has changed and our privacy and belief in government systems, news media and truth has changed. 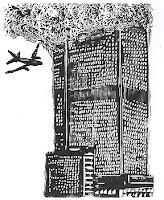 The question as to why the USA attacked Iraq when the terrorists who attacked the World Trade Center were from Saudi Arabia has never been fully answered. If the answer is greed, oil and corporate values over government agency, then we are certainly moving into a different world order in my opinion. Eaton: There are several pages where the character seems to be looking at the reader; can you speak to your goal with this? (In particular and probably the most intense reading experience in the book is Pg 99, after the previous 2 pages had the same person looking downward and then on Pg 99; directly at the reader). Walker: The goal is to engage the reader in the silent dialogue including them in the story as if they were present at the event. The device of having the subject look out at the reader derives from concepts in art theory and the writings of many existentialists and phenomenologists who have explored the concept of the "Gaze". Foucault and Derrida explored this idea in power relations and its context to creating meaning beyond the frame of the picture (in this case the book is the frame). 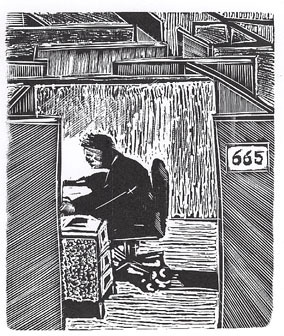 It is a strong signifier that draws the reader into the story as the viewer is more engaged when the subject (the wood engraving) addresses them directly. The reader then must interpret the ‘look’ they are receiving and attempt to decode its meaning. We will never know if we the readers are being scrutinized, analyzed or just observed by the signifier which offers only their symbolic facial expression as a sign of what may be the dialogue between the invisible viewer (you) and the image. Eaton: Was 99 Panels a deliberate choice or coincidental? Walker: I have played with numerology throughout my book. 99 engravings was intentional and so are the time signatures. If you add the numbers together in the time displays they add to 9 or 11. It’s an intentional symbolic tome with deliberate hidden meanings. Eaton: And new projects on the horizon? Walker: I am working on a wordless narrative now titled, The Mysterious Death of Tom Thomson. 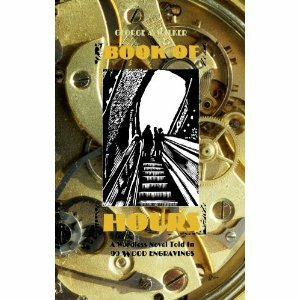 For more information about George Walker & The Book Of Hours, check out his website. Overall I really liked this interview. I have not heard of any of these novels, and do not know really anything about woodcut novels other than how difficult they are to create. Also with the book of hours i liked the intentional symbolism, to me doing that intentionally shows a lot more thought was put into a piece of work rather than it just be something coincidental, it gives more meaning. I would have to disagree with Walker about woodcut novels being different from comics. Just because its history is different and its done on a different medium does not make it different from traditional comics, which are on some sort of paper. Also I have seen some comics that are wordless even though there are not many and most of them are only in newspapers. Nonetheless woodcut novels seem to be a lot more difficult to create, mainly due to having to be made perfectly, and should definitely be looked at more. The section where Walker discusses engaging the reader with his work by having the character look directly at the reader interested me greatly. Comics all obviously attempt to engage the reader, but few attempt to engage them by trying to give the reader the feeling that they are actually there and not just some omniscient third person who is simply looking at the actions and plots as they are unfolding. This sort of inclusion of the reader in the art of comics rather than just having the reader be a passive observer seems like it could be used to great effect in making comics a more entertaining and thought provoking medium. The reader might be forced when engaged in this way with the art in the comic to take a step back and look at both what they are reading and what their thought process is in reading it. This can have the effect of giving the author’s message more weight behind it and having the reader take it more to heart instead of having the reader being a passive third person observer who is removed from both the characters and the story by a wall between their world and ours. After looking at some of the pages of the book, I feel like the work that goes into one of these books is crazy. There is a huge amount of work that goes into making one of these pages, let alone a whole book. Recently I found out how to make an etching using metal. I feel like etchings using metal might be a little harder to make, but last a lot longer and are able to make a lot more prints without losing quality from print to print. I feel like the part where the main character looks directly at the reader is a really effective technique that I feel like more writers or directors should use more often. It really engages the reader or viewer and makes them feel like they have a say on the outcome of the situation. Topic wise, this is a kind of a iffy topic to put into a comic, although, that is what people said about Maus and that is one of the best Holocaust narratives of its time. I have not read this novel, but I feel like it could not be that bad. I mean, it would be really short to read, but it all depends on where the story goes and how the pictures show that. After reading this interview I became very interested in this topic of woodcut novels. This sort of storytelling is neat and it’s very interesting to see how they are made. The whole process sounds very tedious and difficult. These artists have some amazing talent for creating these beautiful pictures on wood. Another interesting part of the interview was Walker’s response to your question about distinguishing between woodcuts and graphic novels. Walker calls woodcut novels direct descendants of religious wood cut novels of the 15th century. In class we argued back and fourth about comics and their origin. Many people will disagree with him, but he makes a good point basing the two separate narratives around history. He says that they are different in both process and presentation. That is a nice way of looking at comics and other graphic art and narratives. Another interesting part of the interview is his discussion of the book he just wrote about 9 11. This is a very deep and emotional topic that seems like it would be hard to cover in a wood print novel. Walker says that he feels like words have limitations and thats why he thinks pictures can tell stories that words can’t. His story focuses on events leading to 9 11 and on various characters. After looking through the book in class it feels strange and almost disconnected. I would like to read more of these novels so I could get a better idea of what this medium has to offer. While not a medium I would pursue, I find myself with a sense of respect and understanding of Walker and his book "The Book of Hours". I enjoyed looking at it in class, as it allowed me an invitation of sorts into the unique narrative found in woodcut novels and other wordless forms of story telling, and I love that with just that much effort and work someone in this line of artistic medium has to put into their craft shows through in their work. 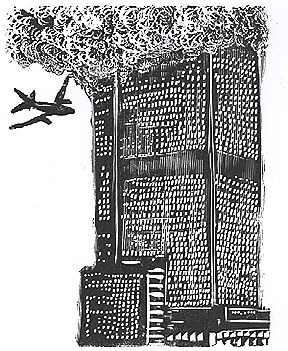 Another thought of interest is I am intrigued by how Walker felt compelled to capture the events of 9/11. The way he described it in the interview just gave this feeling of what art is all about, as a form of expression, passion, and a voice of the soul. It felt similar to Spiegelman and his work with Maus. With such serious subject matter as the focus, it's almost impossible to shake the idea that Spiegelman brought up with how he felt he was a victim of sorts to profiting on a tragedy, when profit was not the intent of the creator more than just doing what true art is meant to do, telling a story. Walker working with the subject in such a way, you just get the feeling that it's intent was that of a true piece of art, and not a way of gaining money as it's driving force. The time and passion it must take to create a woodcut novel is an art in and of itself. And it's that art that I admire in true artists like Walker. Woodcut graphic novels are a new concept to me. I have seen many individual woodcuts in my life, but have never seen anyone put together a collection of them that tell a story. It is an interesting way to make an image. The amount of work that goes into making one of these woodcuts alone is nuts. To be able to make ninety nine images for a book must take forever. The syntagmatic choices alone must take quite a bit of time but to then actually go out and cut the images in wood is mind blowing. Walker says that he had a difficult time constructing a narrative for The Book of Hours. With the brief period of time that I had to look through the book in class, I had a difficult time following the narrative. To me, it just seemed like a bunch of random images from everyday life, aside from the last five to ten pages of course. The only colors being black and white help to convey the point to reader without any extra sensory input. The images in the book are bold and striking but I didn’t feel much closure from one image to the other. I think for myself, the lack of text hurts. That’s not to say it isn’t a good book, I just haven’t had the experience reading woodcut novels nearly enough to follow along with a wordless story. I do enjoy the fact that he plays around with numerology. That was the most interesting thing that I picked up from the interview as I would never have noticed that myself. So while I think the idea of woodcut novels is intriguing and the art is great, I think that I still need words. I thought this interview was really interesting. Personally I have never heard of woodcut novels but i find them fascinating. I thought the section of the interview where Walker discusses the process of creating the picture. The difficulty in creating it let alone fixing mistakes gives woodcut novel creators respect from me. I disagree with Walkers opinion that woodcut novels and comics are two different things. Just because they have differences doesn’t mean they aren’t related, they are both sequenced images conveying a message. I enjoyed looking at The Book of Hours because I thought it was a very touching novel. Some messages are so powerful and universally known that conveying them with no words is just as strong as a regular novel. The tragedy of September eleventh can hardly be described in words, it is more powerful with the lack of words. Wood cut novelists are true artists, creating novels in creative original forms that are rare to find. Not many people create wood cut novels, and that is why they are so popular and unique. I enjoy Walkers works, for their powerful wordless messages, unique style, and amazing stories. Woodcut novels hopefully will still be being created in the future years of novels. I have to say that I appreciate that someone is willing to keep the woodcut novel "alive," so to speak. It would be very easy for this medium to become a relic of the past because they are a lot of work, not to mention they are not something many people are familiar with. To know that there are people out there that are willing to spend their time and effort on woodcut novels makes me feel a little better about the future of comic books. I often worry that the comic book is a dying art form, but perhaps there will always be someone out there looking to keep the medium alive. While I do not think that woodcut novels would ever become popular, it would be nice to see them get a little more well deserved recognition. Actually, now that I think about it, given that woodcut novels were inspired by German Expressionism, there are probably a lot of fans of those movies who would like these novels. And it might be interesting to see comics and woodcut novels crossover a little if someone was willing to create some woodcuts using comic book characters. I would love to see someone try a Superman woodcut novel. I find the subject of Woodcut novels to be very fascinating. Admittedly, it’s hardly my cup of tea, but the process of making them is incredible. I mean, printing an image by carving it (backwards) into a block of wood, then covering them with ink and pressing them into the paper? In today’s age of digital cameras, scanners, and wi-fi enabled printers, I think it takes a certain, I don’t know, fortitude of character to stick to such archaic methods. And this Walker fellow? Well, the man certainly has that aforementioned fortitude, in spades. I can understand why he would be proud of his work; the fact that he managed to pull off the Herculean task of cutting each block to a precise measurement, then sanding it down until it was perfectly smooth, and then finally engraving the backwards image? Now that takes some serious dedication right there. Like I said, not necessarily my preference, but I’d certainly like to check this fellow’s work out at some point in time. From the images included in the blog, the image quality and emotion expressed seems quite good. He also seems to venture into deeper water, psychologically speaking, and I always find that interesting.